The Property Manager was thrilled that we responded so fast! This building experienced a toilet overflow on the 17th floor. SERVPRO of South Pasadena arrived within the hour. We always begin by walking the job with the Engineer and Property Manager to discuss a plan of action. 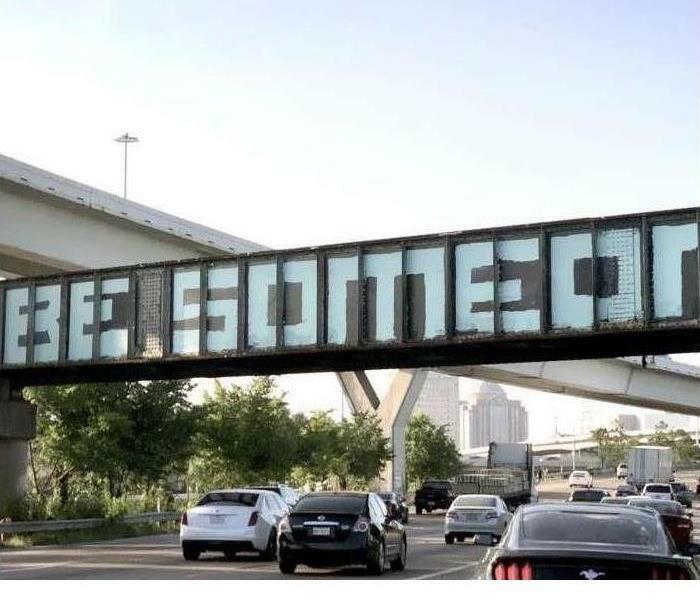 The Be Someone sign is Houston's most famous piece of Graffiti. You can see it stretching over I-45 heading Southbound to Galveston. It can happen to any business at any time. Schools and Downtown buildings understand the fear all too well. One day it’s not there and the next the walls are filled with colored scribbles. Graffiti can come in many forms such as tagging, wild style, or a creative piece. (click here to learn more). Not all Graffiti is created equal. Some would argue it can be a piece of art, others are seen as disgusting vandalism. There are countless reasons people do it but something universal to all version is how difficult it is to clean up. If you find your business marked, have your maintenance man/woman take a look at these tips for removing graffiti. Remove the Graffiti as quickly as possible! The longer it sits the more it settles into the material. Use a 3000psi pressure washer. When using this method do so with caution as too high of a pressure will etch the image you are trying to get rid of permanently into the surface. Sandpaper the image down before removal to weaken the top layer of paint. When in doubt, call the professionals! SERVPRO of South Pasadena in an expert in Graffiti removal. The SERVPRO franchise has developed special chemical cleaners to aid in the removal of paint that, when used correctly, could lessen the damage to the surface trying to be cleaned. Did your building get tagged when you weren't looking? Don't let it be something you stress over and call us at (281)-412-6211. Amadeo, Kimberly. “Hurricane Harvey Shows How Climate Change Can Impact the Economy.” The Balance, www.thebalance.com/hurricane-harvey-facts-damage-costs-4150087. 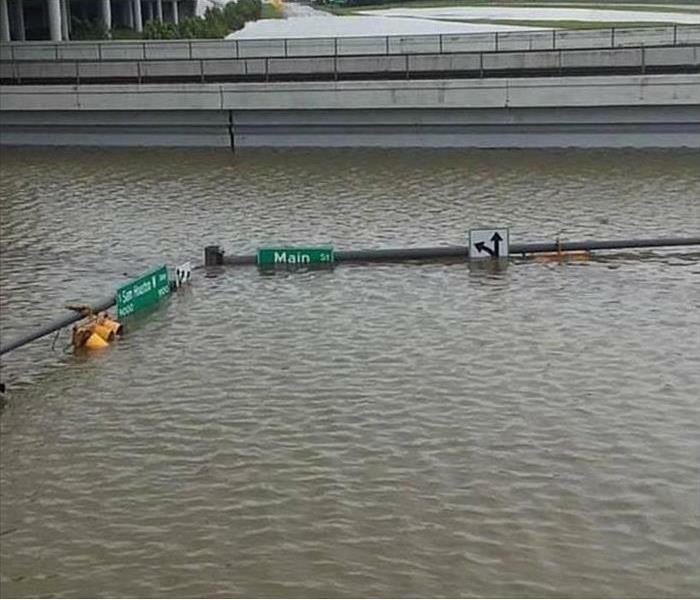 “Hurricane Harvey Aftermath.” Www.cnn.com, www.cnn.com/specials/us/hurricane-harvey. “Hurricane Harvey: Facts, FAQs, and How to Help.” World Vision, 11 Dec. 2017, www.worldvision.org/disaster-relief-news-stories/hurricane-harvey-facts. The CDC has posted the information on the attached link regarding the seasonal influenza occurring at our schools recently. SERVPRO South Pasadena can address this issue, as well as others, with the cleaning products we use. Our disinfectants are EPA, FDA and OSHA compliant, have a very low toxicity rating, and are effective against the most common disease and odor-causing organisms, including MRSA, HIV-1 (AIDS virus), Influenza A2, Avian Flu, VRE, TB, Herpes, and many others. SERVPRO of South Pasadena can address these issues in an educational environment, business environment, or any other setting where many are working in close contact with others. SERVPRO can clean and disinfect the surroundings to prevent the spread of these viruses. Please call our office at (281)412-6211 to schedule an assessment of your situation. Whether water damage affects your home from a pipe break or an external cause, contact SERVPRO for effective remediation services. Why Cross-training Matters in Water Damage Restoration Services here in Houston. 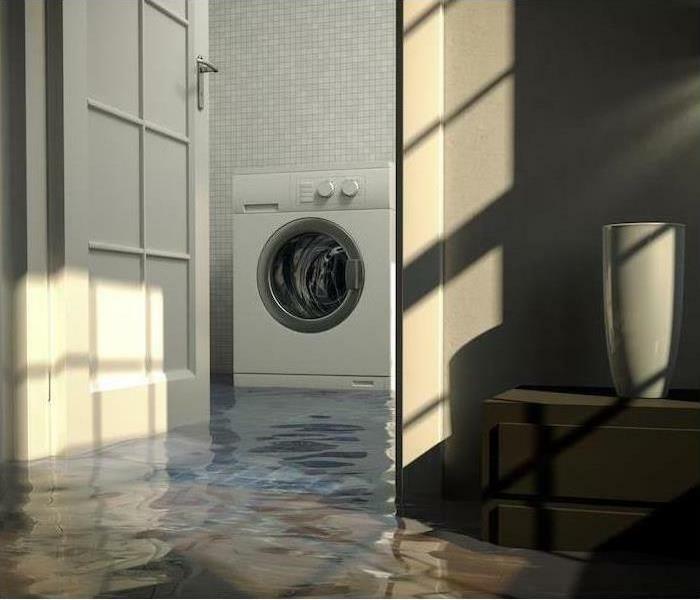 Water damage can be debilitating. Private residents are more often than not ill-equipped to deal with large amounts of water and the longer it is left to sit the more likely it is to cause permanent damage. 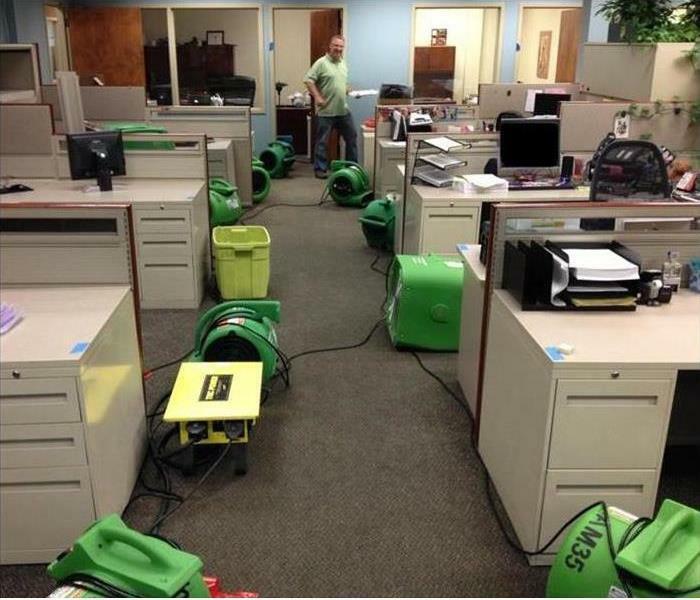 SERVPRO is a restoration company that has built its stellar reputation on professional handling of water and fire damages for commercial property managers and private residents. We are a local company with access to phenomenal resources thanks to our national franchises all over the US. 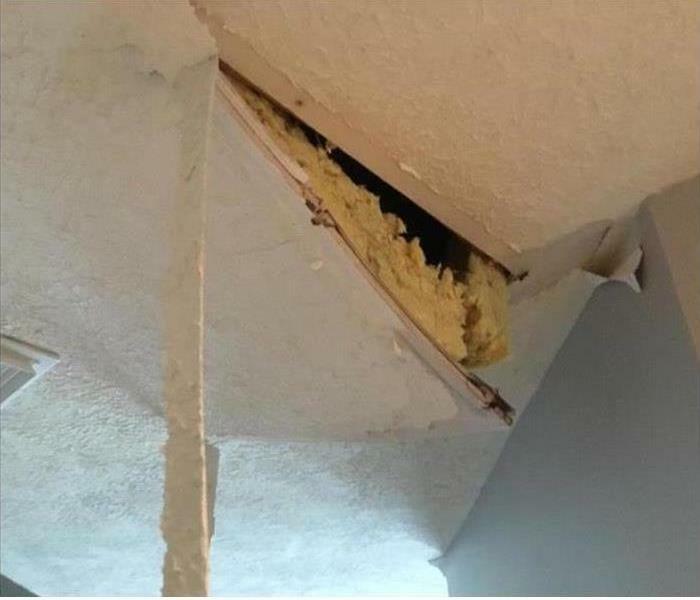 Water damage in Houston properties can often be the start of a long list of problems. The reason is that moisture can weaken structural areas of the home as well as its carpets, fittings, and furniture. 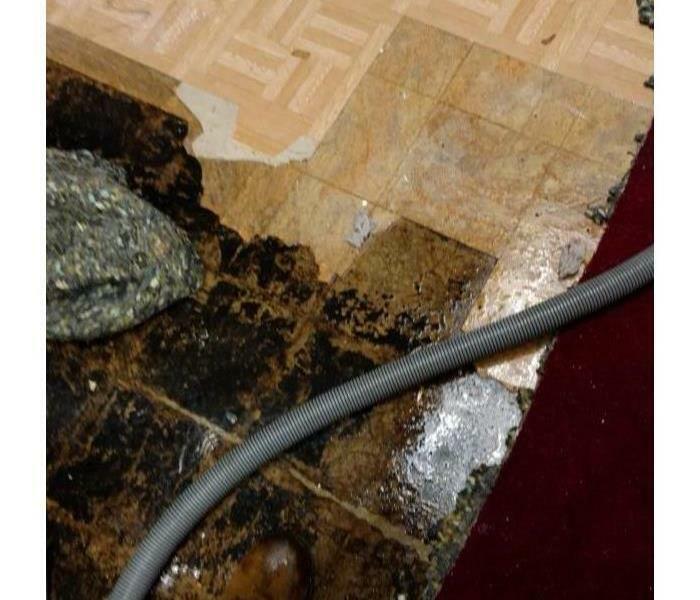 Moist environments are also breeding grounds for secondary damages like mold growth or unpleasant odors. Here at SERVPRO, our technicians undergo intensive training to give them a broad working knowledge of different aspects of remediation and their knock-on effects. A SERVPRO technician usually holds several certificates issued by the IICRC, and they bring that training into every service. Holding a certificate in odor control, for example, can be hugely beneficial during water cleanup. The same can be said for the assessment and remediation of mold which may be discovered during service. It is this broad range of expertise that differentiates our technicians from other providers. Availability is the reason SERVPRO is the restoration service of choice for so many private residents and commercial property owners. We operate a 24 hour a day call line because we know that damages can be unexpected and happen anytime. Having the safety net of an emergency call line is essential to our customers. Because our technicians live and work local to the area, we can also promise to arrive on site within four hours of notification of loss. Fire damage and a fire loss can be repaired by a fire cleanup crew in a few short days and it is faster to contact the commercial fire damage company when the fire is still raging (After you have called Emergency Services first). Our fire damage repair crew will arrive on the scene and immediately begin the process of repairing the home. 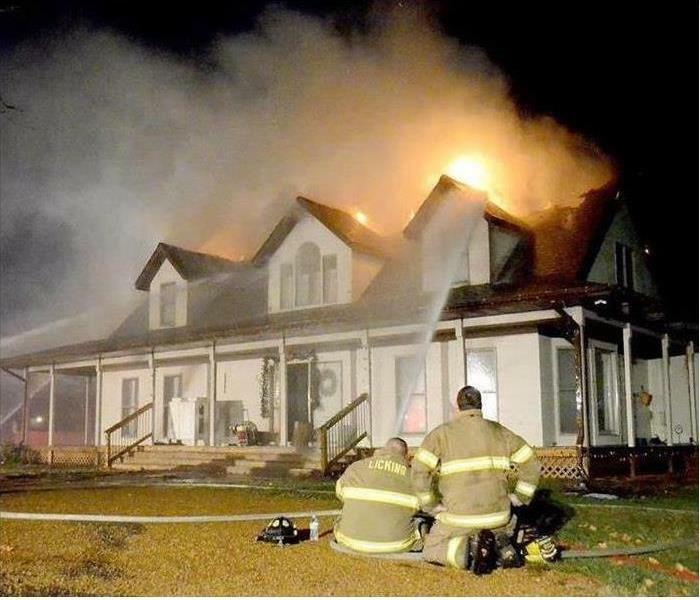 There are fire problems you may not expect to be as severe as they actually are as well as other issues most homeowners don't even consider that have nothing to do with the actual fire. For example, if the Fire Department came to your house and had to use a hose to douse the flames you will have some amount of water damage. Cost Effective. It is by far cheaper and easier to clean an item than it is to replace it. The Faster SERVPRO can respond to your damage the higher the chance we can save some of your personal items. Preserve Air Quality. The longer ash and soot lingers in the air the more it becomes hazardous to your health. Keep The Smell Out. If SERVPRO can get to the scene soon after the damage occurs it is possible to prevent the permanent smell of burning from seeping into clothes and furniture. Prevent Mold. If water was poured onto the fire it stands to reason it soaked your floors and appliances. Left untreated it becomes a perfect breeding ground for mold. Save Time. Believe it or not, the longer damage sits it becomes worse, even if you think its as bad as its going to get. The worse a job is the longer it takes to clean up. Still, it is always faster to repair than it is to build anew. Peace of Mind. The faster your life gets back to normal the less amount of stress is put on your body and mind. Fewer days laying awake at night in a place that isn't your own. Less stress equals a healthier and happier life. You can also rest assured the job was/is being done properly so there are no issues down the line because of cutting corners. When you have fire damage it feels like your life is going up in flames. Breath (just not in the smoke). SERVPRO of South Pasadena will come to the rescue and do what we do best. Make it "Like it never even happened." or better! It’s easy to understand why many people struggle to grasp the facts and issues surrounding indoor mold because of sensational news stories and advertising cloud and obscure the real issues. Educate yourself with the facts about mold and learn about the mold remediation process. Some electrical fires happen because of problems in house wiring or appliance failure. 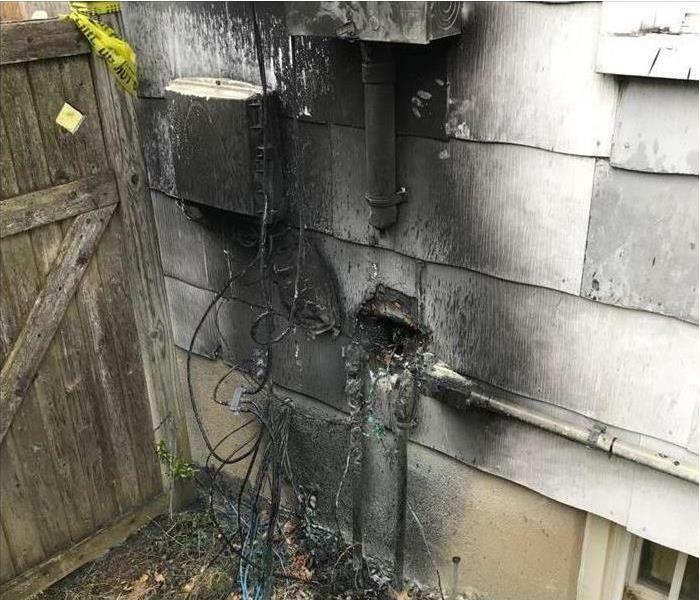 When an electrical fire happens most people are taken by surprise. It usually happens from a simple act done a hundred times before such as turning on a light switch or plugging in your phone, but this time it causes sparks to fly. There are few tells to look for indicating the fire is imminent. Yet with today's safety standards in modern-day products, electrical fires happen so rarely even when we push the wiring to its limit that we are lured into a false sense of security. Frayed Wiring- There is always that one cell phone charger that seems to pull at the ends and become frayed. The wiring may be exposed but you continue to use it anyway because it still works. Please don't. The exposed wiring could spark at any time and cause a fire that would be much more expensive to pay for over buying a new charger. Old Wiring- In between the walls of every home runs a maze of circuitry and copper wiring. All homes are built to code with plenty of electrical charges to sustain modern appliances. As time goes on and we invent bigger, better, and more energy consuming products it becomes harder for the old wiring to keep up. Overpopulated Extension Cords- During the holiday season, this becomes the most common fire hazard. It is also the most common cause of fires during the month of December. High Wattage Bulbs- Every lamp comes with a little warning label informing the owner of the highest wattage it can safely use. Do not stick any bulb in a light fixture because it fits. Space Heaters- The most common cause of a household fire occurring because of these is due to the nature of how easy it is to light fabrics on fire. Keep space heaters away from curtains and organic products. 2/8/2019 - Repair Fire Damage Quickly!